A stabilizer’s purpose is to hinder reactions between other chemicals whereas a catalyst aims to increase the rate of a chemical reaction. Typical catalyst applications include: making gasoline and fuel oils (catalytic cracking), making bulk chemicals, food processing, and more. Typical stabilizer applications include corrosion inhibition, pest control, pharmaceuticals, natural dietary supplements, UV radiation protection, polymerization inhibition, food preservation, and more. Catalysts and stabilizers can be thick and extremely viscous when stored at room temperature and this makes them difficult to extract from their bulk container. Warming the drum reduces viscosity and provide easier extraction. Typically these materials are stored in 55-gallon (208 Liter) drums and classified as hazardous materials. 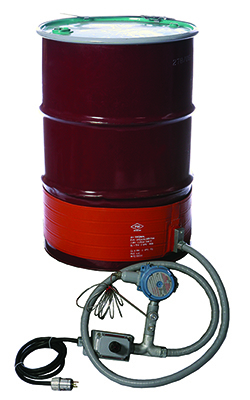 A BriskHeat DHCX hazardous-area drum heater provides the necessary heat to reduce viscosity while meeting the strict hazardous-area requirements. Installation is quick and easy using an adjustable spring-and-hook closure. A plug-and-play design allows the heater to be easily plugged into a standard power source. Once installed, simply set the temperature on the built-in controller to the desired set-point. DHCX series drum heaters are used for many applications that involves heating materials in drums located in hazardous area locations.